This time I’m going to compare two speakers. 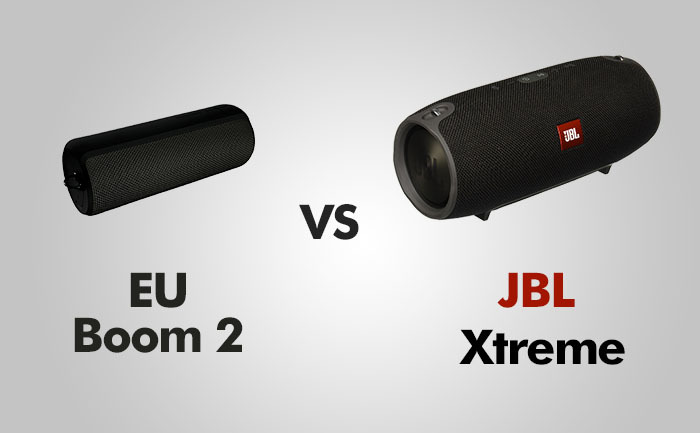 One of them is Boom 2 from ultimate ears and the second one is Xtreme from JBL. Both speakers have their fans and are designed for different environments and uses. I will try to compare their design, sound quality, battery life and how good are they in keeping a connection with a device. At the end of the comparison, I’ll list their pros and cons to help you decide, which device is better for you. UE Boom 2 is much smaller than Xtreme, it’s sleek and fits easily into my backpack, making it very easy to carry around. Great proposition if you want to take it on picnics or to the beach. It’s 178 mm tall and 64 mm in diameter (7 x 2.5 x 2.5 inch) and weighs about 548 g (1.2 pounds). Its design is very similar to its older brother – the original Boom. It has a great compact design and it’s very rugged. It’s wrapped in a nylon-like shell that’s not only splash-proof like the first Boom but also has an ipx7 certificate. This means that it can be submerged up to 1 m (3.3 feet) for 30 minutes. You can even cover it in mud and then spray it with water and it can be used with no problems. It also can handle drops on hard surfaces and keep playing without interruptions. You probably don’t want to take it on a boat or near the swimming pool, because unlike UE Megaboom it doesn’t float. What is very noticeable when you first look at Boom 2 are huge (+) and (-) volume buttons integrated into a design – just tap them to use. They are very convenient and the manufacturer added the function of tapping the top of the speaker with two fingers to pause/play a song or tapping twice to skip a song. Pressing both of these buttons at the same time will give you the precise reading of how much battery life it still has. There is a small metal loop to carry it around or hang. Next to it is a flap that covers a 3.5 mm jack port if you want to connect it to your headphones. Xtreme aka Flip 4 on steroids is 228 mm tall and 127 mm in diameter (9 x 5 x 4.8 inch) speaker. It weighs 2132 g (4.7 pounds). While bigger and heavier, it’s still mobile, just not as easy to carry around as UE Boom 2. For this reason, JBL included carrying strap that you can attach to both sides of the device. Now, you can carry your speaker like a bag. The construction of Xtreme is rock solid. There is no flex and materials seem to be high quality and tightly assembled. It’s wrapped in a nylon splash-proof fabric that gives it a really nice feel. Contrary to UE Boom 2, it’s not waterproof, but offers a protection against water splashes and rain, being a good option to be used outdoors. What I’m a bit worried about are two exposed radiators, which seem easy to damage if not being careful. On the bottom of the device, you will find black rubber feet to keep the speaker in one place and prevent it from shaking off the table. On the back of the speaker, there is an orange zipper to hide all of your physical connection. It can be a bit tight, but after a few times it loosens a bit so next time you want to get to the ports its become easier. micro-USB port for servicing only. 2 USB ports to charge two devices at the same time. On the bottom of the device, you will find small indicator lights to show how much battery life you have. The Boom 2 speaker comes with a dedicated app – both for Android and IOS, which gives you some additional features. Boom 2 also gives you a basic alarm that wakes you up with music that’s stored on your phone. I hope that the alarm feature will be improved because you can’t set alarm for individual days or exclude weekends – you can set it only for every day or disable it. UE Boom 2 is one of a few speakers available which gives you a full 360-degree sound. No matter which side of the speaker is standing out you will receive the same loudness. The speaker is very loud considering its form factor. Of course, it can’t compete with a much larger Xtreme, but for small it’s perfect. At the full volume, it can also be useful for medium-sized rooms. But at the full volume there is sound distortion, so keep the volume lower than 70% – just don’t push it to its limits. This is a good speaker for someone who doesn’t care too much about bass, which is quite average on this device. The mid-range is decent but not as crisp as in other speakers. Still, the sound quality is better than the original Boom. The Xtreme has the most fulfilling sound. The bass is richer and deeper, thanks to its size and special dedicated passive radiators. It provides more immersion than other speakers. You can even feel the bass under your feet. Personally, I didn’t experience any distortion either in bass or treble. This makes this speaker fit for different genres where both low and high notes are important. From EDM and hip-hop to rock and classical music. When it comes to treble, the vocals and melodic guitar parts don’t collide with each other, at least, if you keep the volume at a reasonable level. If you turn up the volume too much you will notice music distortions and harshness, especially in high tones. But luckily the Xtreme gets really loud so you won’t have any problems with that. Highs are bright and crisp, mid-tones are by no means missing either, being both clear and very well balanced all around. UE claims that Boom 2 can be used, in optimal conditions, up to 100 feet from the device. I could get about 80 feet from the speaker until started to have problems with the connection. When it comes to the indoor use of the device, with doors and wall, I had no problem with leaving my phone in different room (one wall) than the speaker. The PartyUp feature allows you to connect wirelessly more than 50 UE speakers. JBL offers a similar feature as UE that is available in all of their new speakers, called JBL connect. Now you can connect multiple JBL speakers from the same source and play them in stereo mode, offering better sound separation than using only a single speaker. Both speakers are missing NFC (near field communication) feature for easy pairing, which is highly convenient for Android users. The battery has been upgraded from 2100 mAh (the original Boom) to a larger 4000 mAh battery. The Boom 2 charges very quickly, in around 2.5 hours. UE claims 15-hour battery life. But for the normal practical use, expect not more than 10 hours on a moderate volume level. When it comes to the battery life, the Xtreme is a clear winner. Despite both UE and JBL claims that their devices can last up to 15 hours on a charge, only JBL can really provide 15 hours. It has a giant 10,000 mAh battery. In my case, it kept the device playing music even longer – for about 18 hours. Charging from a dead battery to full last about 3.5 hours. Xtreme has also a great feature – it can be used as a powerbank. You can charge up to two devices, playing music at the same time. On the bottom of the speaker, you have a 5 LED battery life indicator which let you know when it’s time to charge the battery. PROS: 360-degree sound / Water-proof / Loud / Durable / Compact / Easy to link up / Dedicated app / Can pair multiple speakers. PROS: Great sound quality / Powerbank / Long battery life / Splash-proof / JBL connect. CONS: Weak bass / Battery life could be longer / Lack of dedicated buttons. CONS: No SD card slot. 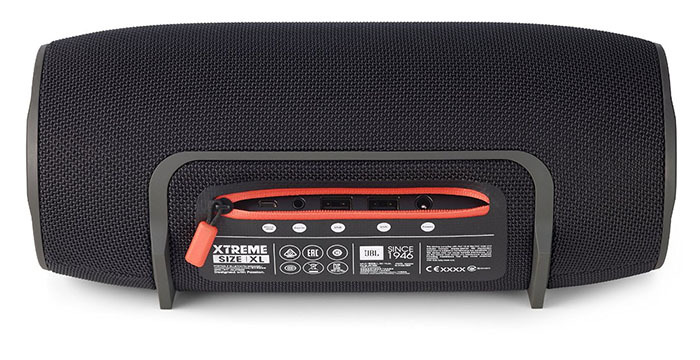 I find Xtreme a much better speaker, especially if you don’t need to travel a lot with a backpack. If you listen to your music at home or going on a car trip, you should go with Xtreme.